The cause of a fire that seriously damaged Hollisters Trading Post at 3286 State Route 28 in Old Forge on Tuesday, March 8 is currently undetermined and being investigated by fire and insurance officials, according to Old Forge Fire Chief Charles Bogardus. Chief Bogardus said his department was alerted to the fire just before 9:30 p.m. by a passerby who smelled smoke as he drove by the structure. When Old Forge fire personnel arrived on the scene shortly thereafter, they found smoke pouring from the building. Eagle Bay Fire Hose Co. and Big Moose Fire Department were called to assist on the scene, with Otter Lake and Inlet fire personnel on standby at their respective departments. Bogardus said approximately 55 area fire personnel assisted in battling the blaze, with nine trucks on the scene pumping water. “Luckily we had plenty of water between the pumper trucks and the hydrant close by at VIEW…and we’re very fortunate there were no personal injuries,” he said. Along with the fire personnel, Bogardus commended bystanders who immediately went into action grabbing truckloads of sand from the Webb Highway Department and throwing it on the icy parking lot to create traction. “It certainly made our job a lot easier,” he said. Bogardus said they were on the scene until approximately 3:45 a.m., with two members returning to the station in case there was a rekindle of the fire. Hollisters Trading Post is owned and operated by Will and Andrea Hollister of Old Forge. Formerly known as Holly Woodworking, it was founded by Will’s aunt and uncle, Gretchen and Keith Hollister, in 1957. 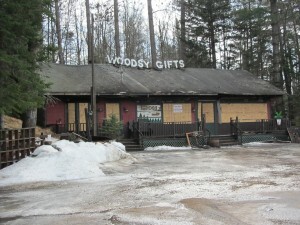 Will and Andrea purchased the business on the outskirts of the Old Forge village in 2004. In 2012 the couple was recognized with a U.S. Small Business Administration’s Excellence Award based on their longevity, innovation, sales growth, increased employment, ability to overcome adversity, and community contributions. It is their plan to rebuild and be open for the 2016 summer season. Written by: Marianne Christy on March 10, 2016. Last revised by: Gina Greco, our reviewer, on March 31, 2016. This entry was posted in admin and tagged fire, Hollisters, ReOpen on March 10, 2016 by Marianne Christy.